Anyone living in DC will attest that you often see some really weird stuff lying around in the streets and alleyways after the weekend–the Sunday morning walks of shame among them. When I lived in the Mt. Pleasant/Columbia Heights area, I’d see abandoned (complete) outfits, odd bits of street art* and the occasional sofa. 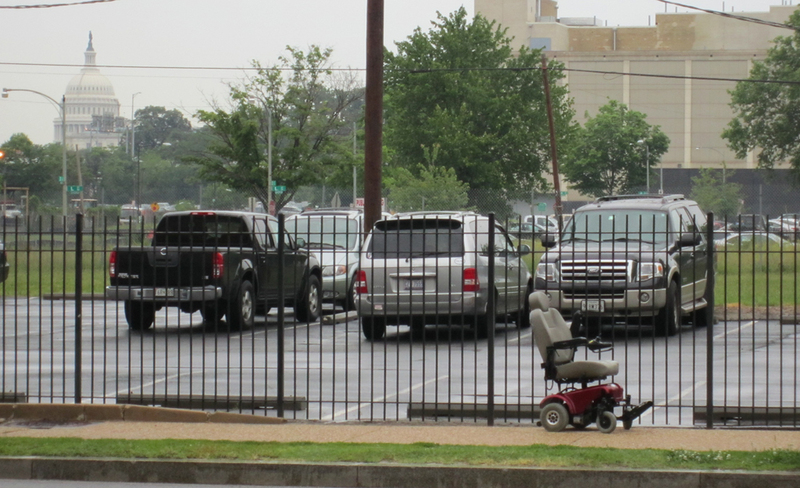 But I can’t imagine what set of circumstances led someone to abandon a mobility scooter chair. You’d think that they might need that! I’m probably missing the most obvious explanation. They didn’t run out of power, they ran into it: The Power of The Lord. ** It was a modern-day miracle, right here on M Street SE and we shall all bear witness! I somehow doubt the city employees that will eventually be tasked to remove it will feel similarly moved. * Seriously, when you’re walking home from a friend’s place and maybe already a bit–or a lot–tanked and you see a baby from Jenkins’ Storker Project, you really start to wonder if you’re losing it. It has to be the urban equivalent of pink elephants. ** As opposed to The Power of Madonna. Previous story health: commence le rayonnement! It was The Rapture. Alas, he or she was the only sinless one among us. .-= latest entry: Scored another one =-.